When did God plan the church? Religion has many ideas about the origin of the church of Christ. Some believe that God decided to build the church in response to the Jews' refusal to accept Jesus while He was on the earth. But the Bible teaches that the church was in the mind of God from before the foundation of the world" (Matthew 25:34; Ephesians 1:3-4). The church is depicted here as a group of people with an outline of a building around it (when you teach, be sure to specify that the church is the people, not the building). The timeline begins with "eternity" and then shows the church in the "mind of God" before creation. 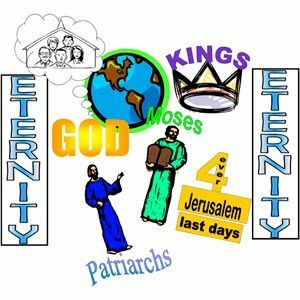 Even though the details of God's plan were a mystery throughout time, the coming of the church was taught in some way throughout these periods of time: Creation, Patriarchs, Moses, Judges, Kings,Prophets, Jesus, The Church. Additional facts shown are that the prophets taught that the church would be built in Jerusalem in the last days and would last forever, and that the church will go home to heaven at the end of time. Combine the visual with an audio learning aid by singing "The Father's Plan," available in the songbook To Know God...in Song. Note: This background is blank. It may be used for any purpose. View ¿Cuántos libros están en el Nuevo Testamento?